As Sarah Weinman reports, in a signed note on the back of the forthcoming James Ellroy novel, Blood’s a Rover, the Demon Dog of Crime Fiction is urging all of his readers to find him on Facebook. This may very well be the most brazen Web 2.0 pitch in the history of book industry marketing. And the last thing I want to do is kick a Demon Dog when he’s down. 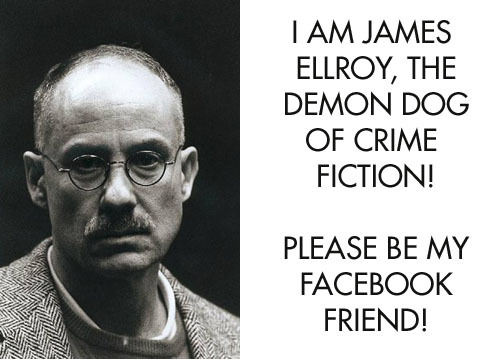 So go to Facebook, find James Ellroy, and lift this great writer’s spirits for the benefit of arts and letters! Perhaps by befriending Mr. Ellroy in this manner, he might be tempted to write even stranger novels for the joys and pleasures of readers around the world! (That is, when he’s not being poked by people he barely knows, given virtual gifts, or being chatted up by bored 15-year-olds.) Now if only we can convince Mr. Ellroy to get on Twitter and Tumblr, then we may very well make Mr. Ellroy the Demon Dog of All Media.